J. Linn. Soc., Bot. 18: 196 1880. Origin and Habitat: Eastern Cape and KwaZulu-Natal (Mapumulo to Port St. Johns), South Africa. Habitat: It grows only in a few isolated spots, usually in partial shade in dry areas, on quartzitic sandstone rock formations or on shale, sometimes hanging down from rocky ridges and cliff faces often along the sandy shore. It is also found on rocky outcrops among leaf litter in river valleys. Climate: The climate is warm, without frost, and hot and humid during summers. Rainfall are abundant (1000 to 1250 mm) and concentrated mainly in the summer months. Winters usually are dry but sometime more cold and rainy. Ecology: Flowers are pollinated by sunbirds. It is becoming increasingly rare and is in need of protection. 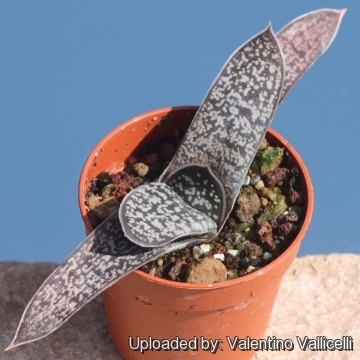 Description: Gasteria croucheri is a very large, handsome Gasteria with a characteristic aloe-like appearance up to 400 mm high, with erected or spreading leaves. It is often solitary, but occasionally it may form small clusters of up to 8 individuals or more. Stem: Short 2,5-5 cm long. Rosettes: Dense both in opposite rows (distichous ) or in spiralling rosettes, with 12 to 18 leaves, reaching a diameter of up to 50 cm or more. Leaves: Stout, lanceolate, strap-shaped, trigonous, tappering toward the tip, waxy, spineless and fleshy, 20-37 cm long, 3-10 cm broad and about 2,5 cm thick at the base. They are greysh-green smooth but white mottled and often tinged in purple in full sunn or under stress conditions, concave on the upper surface and keeled below. The apex is rounded with a short, pointed mucro. The leaves in young plants are always distichous, often tuberculate and quite different to the smooth adult leaves. Inflorescence: The inflorescence is a many flowered panicled raceme up to 50 mm tall, spreading and flat-topped. 8) Crouch, N., Smith, G. and Symmonds, R. 2000. 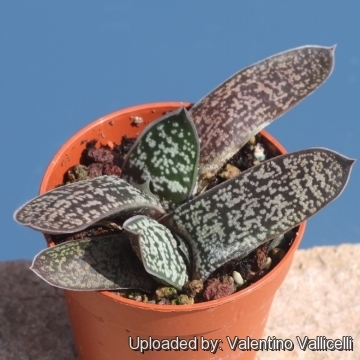 “Gasteria croucheri - the magical impundu of the Zulu.” British Cactus and Succulent Journal 18(2):70-78. 9) Hilton-Taylor, C. 1996. “Red data list of southern African plants.” Strelitzia 4. South African National Botanical Institute, Pretoria. 10) Raimondo, D., von Staden, L., Foden, W., Victor, J.E., Helme, N.A., Turner, R.C., Kamundi, D.A. and Manyama, P.A. 2009. “Red List of South African Plants.” Strelitzia 25. South African National Biodiversity Institute, Pretoria. 11) Scott-Shaw, C.R. 1999. “Rare and threatened plants of KwaZulu-Natal and neighbouring regions.” KwaZulu-Natal Nature Conservation Service, Pietermaritzburg. Cultivation and Propagation: Cultivation and Propagation: It is of easy culture and can grow on window sills, verandas and in miniature succulent gardens where it is happy to share its habitat with other smaller succulent plants, or in outdoor rockeries. Growth rate: It is a relatively slow-growing plant that offsets to form in age small clusters. Soil: It is tolerant of a wide range of soils and habitats, but prefers a very porous potting mix to increase drainage. You can grow a plant in a 10-15 cm pot for years and have perfectly happy plants. For best results, use a shallow pot. Feeding: The plants are fertilized only once during the growing season with a balanced fertilizer diluted to ½ the recommended strength. Plants react well also to organic feeding (compost or any other liquid fertilizer). Hardiness: During the winter months, water only when the soil becomes completely dry. Frost hardy to -1°C (Or less). It grows well in frost less Mediterranean gardens. Remarks: Gasterias are best planted in a partially shaded and airy part of the greenhouse, and not too close to the glass roof or sides of the house as the plants can overheat during hot spells. 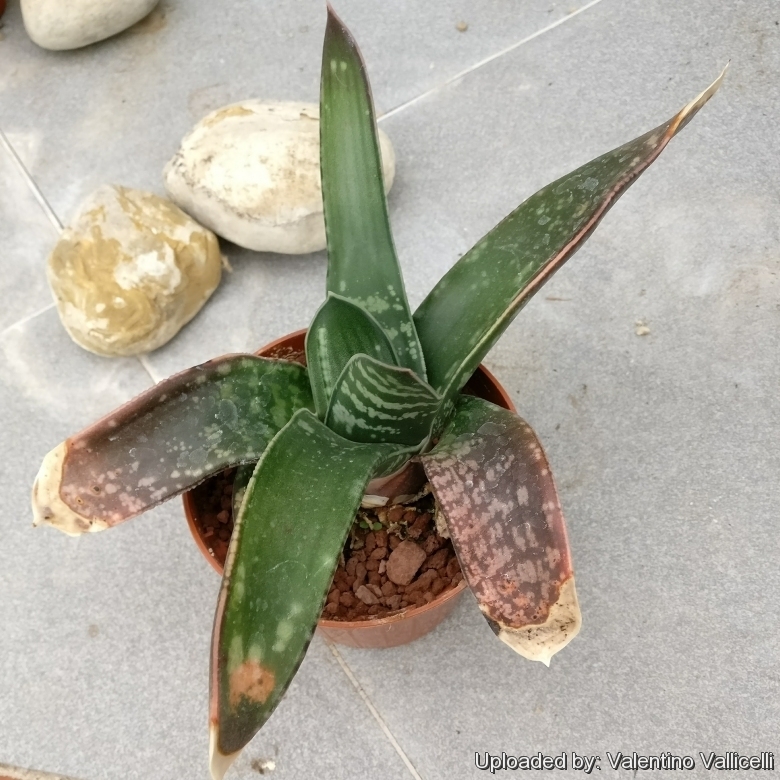 Traditional uses: Gasteria croucheri is a popular plant in KwaZulu-Natal used medicinally as an emetic for the treatment of hysteria in girls. It is also sometime placed on the rooftops of houses in the Eastern Cape, with the belief that the lightning will not strike the house. This plant is the “The Invisible-maker” of the Zulu people. Parts of Gasteria croucheri are used in faction fights, believing that it will make them partly camouflaged so the enemy will not see them. Propagation: Gasterias are easily propagated by the removal of offshoots or by leaf cuttings in spring or summer. To propagate by leaf cuttings, remove a leaf (best in spring) and let it lie for about one month, giving the wound time to heal. Then lay the leaf on its side with the basal part buried in the soil. This leaf should root within a month or two, and small plants will form at the leaf base. Cuttings are best rooted in clean sand. Once rooted, plants can be planted into individual containers. They can also grown from seed. Sow seed during spring or summer in a warm, shady position in a sandy, slightly acidic soil and keep moist. Cover with a thin layer of sand and keep moist. Germination is usually within 20 days. Seedlings grow slowly and are best planted out about a year after sowing. It is recommended to apply a fungicide when growing it from seed.